Martech QUL Service Tools it's new service tool from Martech Team, designed for servicing LG phones based on Qualcomm CPUs. Innovative solution in QUL is most safe method for unlocking: read out original unlock codes like Simlock, CLCK, NCK, ... and after reading codes you can unlock/lock from keyboard. FOR THIS ACTIVAITON NO SHIPING COST - THIS SERVICE ARE MAKED OVER E-MAIL USIGN SUCH PAYMENT METHOD AS CREDIT CARD, PAYPAL, MONEYBOOKERS, WESTERN UNION OR T/T BANK TRANSFER. 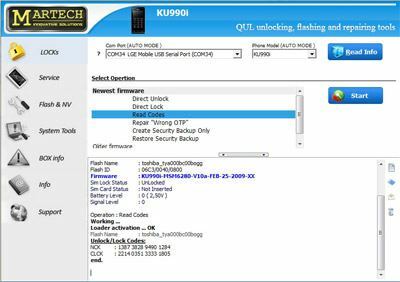 NOTE: QUL Tools reads unlock codes in phones with new firmware. All other can be unlocked with Direct UnLock mode. QUL works on various models, versions and algorithms from 2008-2010 years and on all olders. - tests of audio, backlight, bluetooth, radio, irda, lcd, mic, buzzer etc.